Do Cubs Fans Know What They Have in Castro? 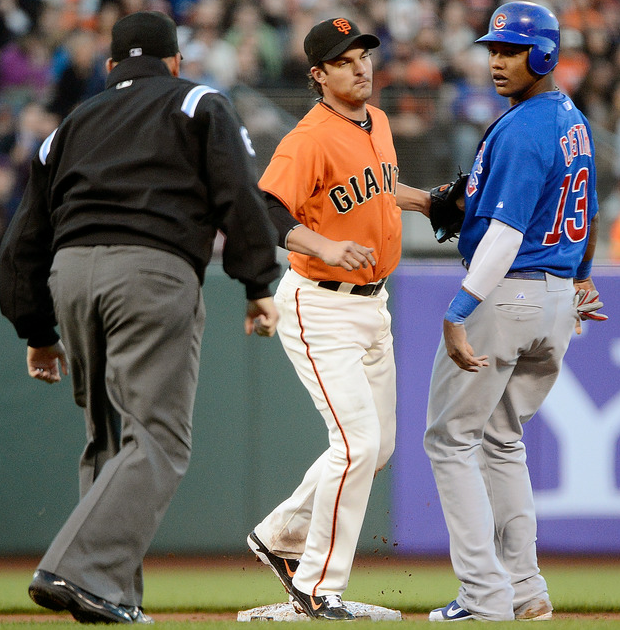 It hasn’t been the best week for Starlin Castro, or the Cubs for that matter. In the past week Castro has attempted a stolen base and didn’t slide (you rarely see that), and more troubling forgot how many outs there were on a potential inning ending double play so he didn’t even attempt to turn it. Some people say that it doesn’t matter because the guy would have beat the throw, wrong, it does matter, and it’s everything that Sveum, Theo, and the whole Cubs organization is trying to get rid of. The result of this rough week was Dale Sveum putting Castro on notice, ““It’s something that’s obviously unacceptable at any time,” Sveum said. “Whether we could have turned the double play is irrelevant to not knowing how many outs there are in the most important part of the game. These things have to stop happening or we’re just going to stop playing [him]. These kind of things are things my son does in high school. Maybe …. I’ll have a good talking to him. It’s the last straw. If he wants to play, he better start getting his head in the game, period.” Sveum has it exactly right, this can’t go on, and Sveum handled it correctly, something Cubs fans could learn from. The overwhelming majority of Cubs fans be it on twitter, message boards, etc. are clamoring for Castro to be traded now. The erroneous USA Today report claiming that Castro could be had for the right price was what planted the seed in the head of Cubs fans, like Inception. Then Castro’s recent “brain farts” just made the thought of trading Castro make so much sense. Any good General Manager listens to offers for every player because there is no way of telling what another team thinks your player is worth until you hear what they will give up. That said, a great General Manager knows when to say no thanks, we will keep our superstar. I can see the argument from fans, I really can, move Castro and get two great prospects in return. I can see why some would say that, but I can’t see why a handful of mistakes from a 22-year-old are grounds to be traded. That leads me to ask the question, do Cubs fans really know what they have in Starlin Castro? My answer, no, they don’t. Let’s break down the two different scenario’s that would be a reason to trade Castro. First, let’s say that some team will offer the Cubs two A level prospects in return for Castro. Seems like the perfect scenario for a rebuilding club that needs to get better in many areas. Plus the Cubs have the likes of Junior Lake and Javier Baez, both shortstops for now, rising through the system. Here is my problem with that. Junior Lake is the same age as Starlin Castro, yet fans can’t get enough of Lake because he is “already” at Double-A Tennessee. Guys, Starlin Castro received five Rookie of the Year votes in 2010, made the National League all-star team in 2011, and also received 23 MVP votes in 2011…. 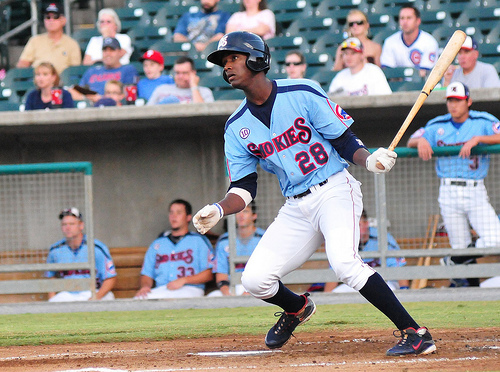 Junior Lake is in Double-A. 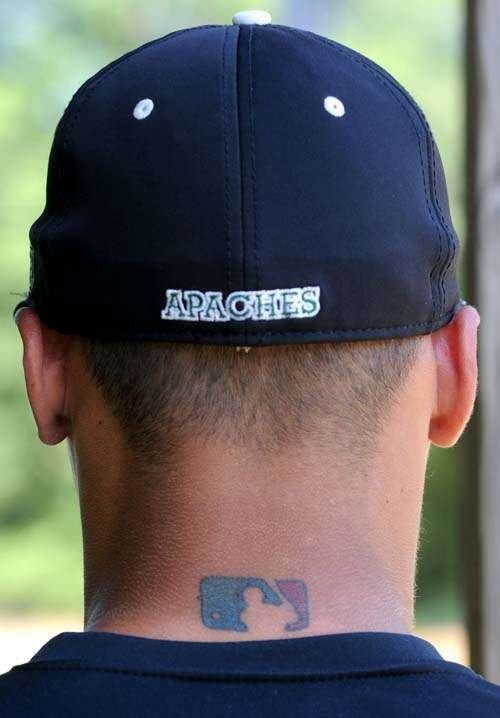 Javier Baez is the other kid that gets mentioned when the talk of moving Castro comes up. You think Castro looks listless on the field, wait till you see Baez. The kid knows he’s good, and when that happens they come across to the average fan as not caring about their craft. Problem is the game is so easy for them and it has been for so long, kind of like it is for Castro right now. Baez currently sits at Low-A Peoria, and he’s doing well, he’s 19 years old….Starlin Castro hit .300 at the Major League level when he was 20. Seeing a trend here? Any “prospect” is just that, a prospect, no one knows how they will develop, why take the chance of having a prospect become a good player when Castro already is and he could be great. Same goes for what the Cubs would receive in one of these deals. There is no guarantee that anyone received in a deal, no matter how highly praised they are, turn out to be anything close to Castro, it’s not worth the risk. The second scenario where Cubs fans could justify moving Castro is his mental lapses on the field during games. Think about that for a second, some Cubs fans are saying that an acceptable reason for saying goodbye to a 22-year-old shortstop that has 416 career hits in 338 career games is that he didn’t slide, or he forgot how many outs there were…. really? Don’t get me wrong, I’m not making excuses for Castro, and I agree with the way Sveum is handling it by threatening a benching, but that’s it. Sure Castro needs to start focusing a lot better when playing this game, but his lack of focus is not even close to an adequate reason for dealing Castro. According to these fans then when Castro strolls into Wrigley five years from now (27 years old) and goes 4-for-5 with a home run, a triple, two stolen bases, and 4 RBI’s off of our still trying to figure it out pitcher it will be okay because he thought there was one out in an inning instead of two outs five years ago. I have no problem with Cubs fans offering their opinion on what to do with Castro, but the fact that they think there is a need to do something with Castro other than sit back and watch him develop into an elite shortstop proves my point. Cubs fans do not know what they have in Starlin Castro. I know that the last thing fans need to see when a team is bad is a player that has repeated mental lapses. It’s easy to take your frustration out on Starlin Castro, but what he does contributes more towards winning than losing. Just remember who Castro’s influences at the Major League level have been. 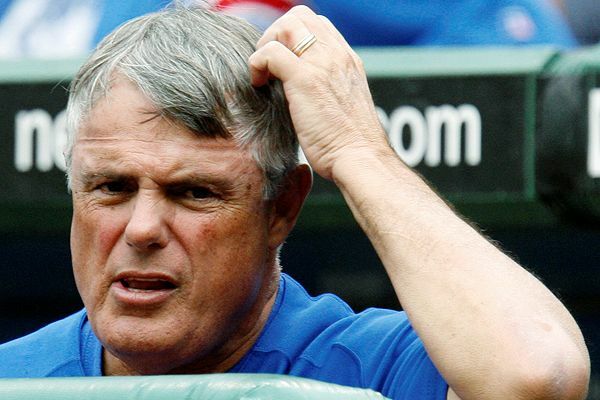 Year one, Lou Piniella on his farewell tour. Year two, Mike Quade who tried the approach that so many Cubs fans are right now, throw the best and youngest player on the team under the bus, we see how that worked out. Both years, Aramis Ramirez, if we learned anything from Aramis it was how not to hustle, how not to field your position, and how to care less about the game. Castro will get better with his focus, and with his production which is already terrific, if he doesn’t, he will sit down for a few games, but he will still be a Cub, and rightfully so. Author bornonthirdcubsPosted on June 6, 2012 September 9, 2014 Categories 2012 Regular Season, RantsTags Aramis Ramirez, Castro keeps messing up, Dale Dveum Threatens Castro, Javier Baez, Javy Baez, Junior Lake, Lou Piniella, Mike Quade, Starlin Castro Mental Lapse, Theo Epstein, USA Today Castro Report, Will Cubs Trade CastroLeave a comment on Do Cubs Fans Know What They Have in Castro? Are you kidding me? Carlos Marmol has become the goat for the 2012 Chicago Cubs, and Cubs fans aren’t about to let their voices go unheard, I’m one of them. The latest episode of failure was this afternoon where the Cubs were sailing along to a victory and a two game sweep. 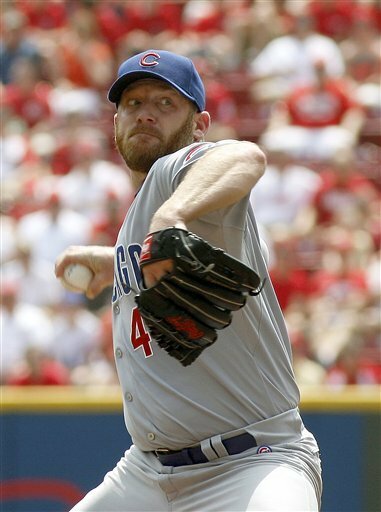 Ryan Dempster was dominant going 8 innings, throwing 101 pitches. Let’s stop right there for a second. I don’t want to start piling on Dale Sveum yet, I’m really going to try hard not to. Why is Ryan Dempster not starting the 9th inning? I’m sorry, I don’t understand why your #1 starter can’t throw more than 101 pitches. He’s coming back from an injury, I get that, but this is beyond ridiculous that he has to sit on the bench and watch his awesome effort go to crap because another guy on the team has the “role” of finishing games. Give me a break, nothing, nothing Carlos Marmol has done this year or last year warrants him getting opportunities to carry a Dora the Explorer backpack let alone close out major league baseball games. I see the other side of it, trust me, Dempster did enough, he should be able to sit on the bench after 101 pitches and watch a competent pitcher get the final three outs. The Cubs have some of those too, none of which are named Marmol. James Russell starts the 9th the Cubs win, Rafael Dolis starts the 9th the Cubs probably win. Henry Rowengartner starts the 9th the Cubs definitely win. Another issue I have is why is Marmol allowed to get out of jams he creates, he hasn’t gotten out of one yet this year. If Marmol is coming in then there better be someone warming up in the pen just in case the typical happens. What, you don’t want to disrespect the mighty Marmol by having a pitcher warming up? Too bad, does it show a lack of confidence in Marmol, sure does, because that’s exactly the case, no one has confidence in Marmol, not even Marmol. Without Marmol’s “efforts” the Cubs would be at or just above the .500 mark and full of confidence, yet they sit at 9-16, dead last in the Central. But hey, at least Marmol’s getting his work in, you know, building his confidence in easy save situations. Enough, Marmol is done, consider the closer position an open one. That’s what Sveum and Company should do, enough rewarding the contract, and what he is supposed to be, and start rewarding guys who are performing. Sorry, totally fed up with Marmol and the Cubs enabling him, back to your regularly scheduled programming, recaps and such coming up.